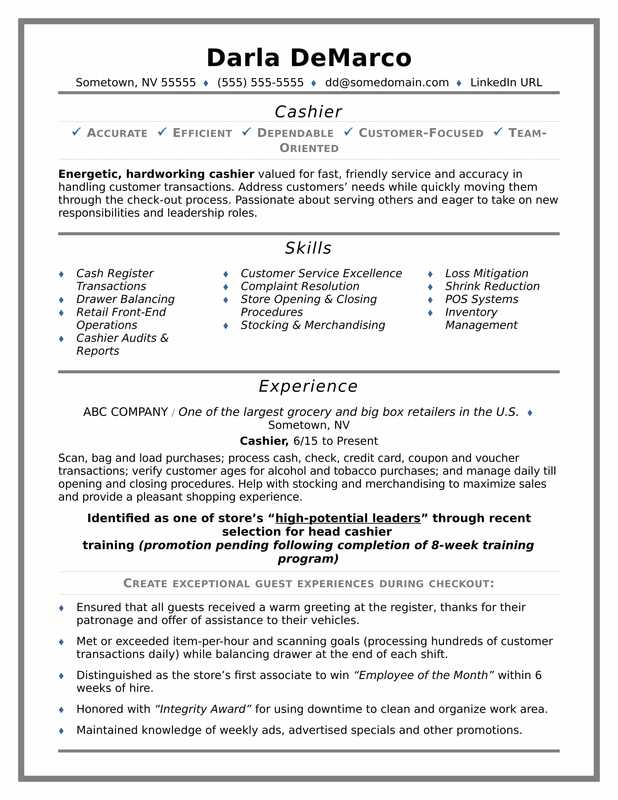 Scan this sample resume for a cashier to help you bag the job. When it's time to shop for a new job, does your resume say, “Cha-ching!” or does it need to be exchanged for a new one? To be a successful candidate for cashier jobs, resume expert Kim Isaacs says it helps to have a winning resume that will put you in the express lane. For writing tips, view this sample resume for a cashier that Isaacs created below, or download the cashier resume template in Word. According to the Bureau of Labor Statistics (BLS), you'll find the highest level of employment for this job in the following states: California, Texas, Florida, New York, and Pennsylvania; and in the following metropolitan areas: New York City, Los Angeles, Chicago, Atlanta, and Houston. As a cashier, you can expect to earn a median wage of $20,820 per year, or $10.11 per hour, according to the BLS. Additionally, you can learn about retail careers or search for cashier jobs on Monster. Energetic, hardworking cashier valued for fast, friendly service and accuracy in handling customer transactions. Address customers’ needs while quickly moving them through the check-out process. Passionate about serving others and eager to take on new responsibilities and leadership roles. Scan, bag and load purchases; process cash, check, credit card, coupon and voucher transactions; verify customer ages for alcohol and tobacco purchases; and manage daily till opening and closing procedures. Help with stocking and merchandising to maximize sales and provide a pleasant shopping experience. Ensured that all guests received a warm greeting at the register, thanks for their patronage and offer of assistance to their vehicles. Met or exceeded item-per-hour and scanning goals (processing hundreds of customer transactions daily) while balancing drawer at the end of each shift. Distinguished as the store’s first associate to win “Employee of the Month” within 6 weeks of hire. Honored with “Integrity Award” for using downtime to clean and organize work area. Maintained knowledge of weekly ads, advertised specials and other promotions. A strong resume will show hiring managers that you've not only got the skills and customer service smarts to do the job, but you can also bring value to their organization. Not sure your resume is doing its best? Get a free resume evaluation today from the experts at Monster's Resume Writing Service. You'll get detailed feedback in two business days, including a review of your resume's appearance and content, and a prediction of a recruiter's first impression. It's a quick and easy way to help you put your most professional foot forward.